SAGE Magazine is honored to award Pamela Sonn’s “The Memory of Trees” third place in our 2014 Emerging Environmental Writers Contest. Photo by Mark Byzewski/CC YP. 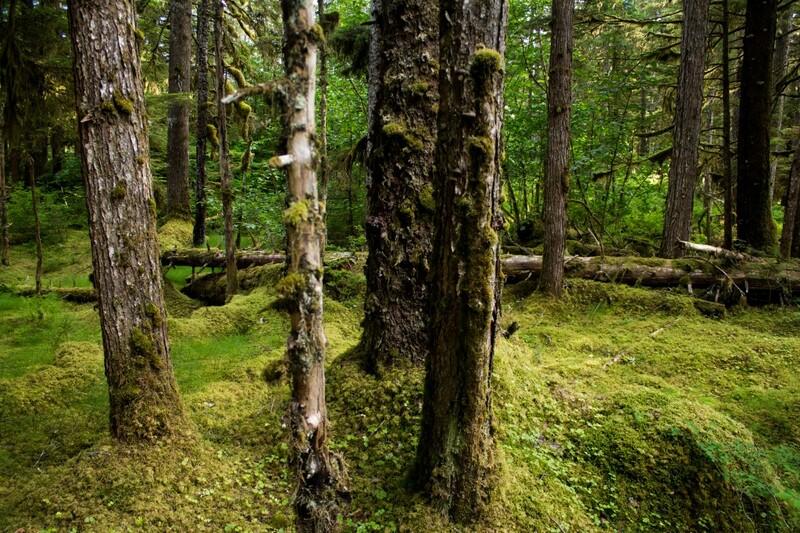 Here, in the temporal rainforest of Southeast Alaska, the line between sleeping and waking is soon melted with the persistent, erosive power of 150 inches of rain a year. The rhythms and patterns of this land seep into us. They permeate the supposedly waterproof seams and zippers of our individual tents. They creep in under our high-tech coats and pants so that we cannot ignore them. The two of us from the “Lower 48” are told about the seal people who follow our team with languid eyes and trail our kayaks. But we do not know this second, hidden part until we look closely and start to recognize the heads slowly rising and breaking the silver surface of salt water between raindrops. We are measuring a stone fishing weir — an ancient remnant half circle of slightly stacked stones in a tidal river — when the clouds thin and everything from the tall trees to the jagged white mountains is emblazoned with warm, unfiltered sunlight. Quickly striding for the shore to sit on boulders, we take off boots, extend wrinkled toes and hope socks will get less damp. We speak wistfully about dry socks. In a place where the humidity is not expected to get below eighty percent during the month we are there, dry socks are mythical. Paddling in unison, we glide on. A slippery, sideways roiling shows us the action and reaction of an incoming tide over shallow rocks lurking inches below. We push harder, paddle with one mind, and four arms. We glide with greater speed to drive beyond the churning. The other boat is doing the same. We are sure the four of us will all fall asleep at the same time and wake in near unison before dawn. Rounding a peninsula, we pass a decrepit forty-foot square log raft with a tiny metal shed rusting in the middle. The raft rests upended and storm-cast into the forest’s edge. At its base, many years’ accumulation of logs, branches and seaweed constantly knock together with each undulating wave. There is one battered plastic bottle bobbing in the organic soup of dissolving sticks. It strikes me that vinyl houses will never stand here. This place is the opposite of sheetrock, wallpaper and baseboard. We stop on the other shore, position the kayaks out of the water, tether them and stretch. Water turns quickly to forest. We clamber a narrow band of rough and slippery boulders, half falling, half sliding, silently reminding ourselves that our nearest help is twenty-three miles away, beyond a five mile paddle to a possible radio connection. Entering the forest, our relationship to scale is flipped. We are ants approaching huge downed limbs that are slick with green. Moss the depth of my hand covers the curves and contours of forest detritus. Every fallen branch and every moldering trunk is a shade of chartreuse or viridian. The standing trees sweep our eyes up. Up, up they direct. I see them pointing together at a central vanishing point in the sky. I picture a round planet entirely populated with these giant trees like a ball covered with thousands of little outward pointing straight twigs. They are all pointing to different places in space. The duality of these two views of infinity is palpable here. We proceed by shinnying under, over and through the giant duff. My whole leg goes down into a hole. I point my toe hoping to find purchase on soil or bedrock. No luck. All I can reach is plant material in various states of spongy decay. I get both feet back on the same layer again and we circle the trees, looking at bark. In a swale, six-foot tall skunk cabbage hides us from each other. We move slowly, hoping that no one surprises a bear. We boost and pull each other onto a flat-topped stump spacious enough to hold several compact cars. The expanse is incongruous, and it has been here a long time; the surface is crumbling into deep, soggy fissures that lean over where we tread. I notice that I can take more than three steps in a row without slipping or having to climb over something. After two weeks here, my leg muscles have been trying to reconfigure, forgetting how it feels to walk unimpeded in a straight line. The forest archaeologist remarks that this individual was probably felled in the 1920s. How did long-ago loggers cut down a tree that size? How did they get the wood out? There is no opening down to the water big enough to roll segments but somehow it must have come down to be floated to a mill. I imagine the tree that was. If it were still here, we would be encased in a column of water and cellulose meditating on the canopy of heaven. Sunny days, cold years, dry seasons, and wet decades come and go, yet the scope is magnified out of the range of human knowing and into the imagination. Imagine growing to be 250 to 300 feet tall like a Sitka spruce. Imagine being a Western hemlock seedling in the year 814 A.D., and still alive after thirty-four generations of humans have come and gone. In my here and now, this tree’s place in the forest is most noticeable as an island of flatness slowly melting into the humus. Seedlings of different species are taking root right out of the fertile surface of the old stump. Other giant sentinels crowd around. We slither down and resume looking. Today we find one. A tree stripped. The scar is an unintended message. The bark was harvested in one long ribbon up the trunk. Decades, even centuries before our visit, a human stood here and chipped a foot-long horizontal groove in the bark then pried it loose. The rip peeled the bark into a long fifteen-foot vertical fragment. The bark was taken away to be transformed into Haida or Tlingit baskets, twine, and clothing. Forms on clipboards in plastic bags come out, along with tape measures and pens. We open the ends of the bags, stick our hands in and write, hoping to record the information before the paper inside gets too wet to take ballpoint. The forms register the location and measurements of the Culturally Modified Tree. Nearby we find another CMT. This one is the beginning of a canoe. The inside of the canoe was half hewn. The ends were marked and lightly shaped. Then the work stopped. The tree resumed being a tree with a canoe emergent. It is a living tree-canoe wearing a memory in its cambium. We get out tools, document it and move on. We do this for days. We paddle into inlets looking for places where we can land the boats, but also with an eye to where people could have landed boats in the past. We are tracking them in traces of stone and living wood. We are attuned to subtleties: a pile of rock, a chipped edge to a cobble that could fit in the palm of a hand, irregularities in tree bark. There are three footprints in a narrow wash of mud at the shore one cove over from where our tents are pitched. They are from a wolf whose feet are the size of dessert plates. Someone says it is an Alexander’s Archipelago Wolf — rare, special and big. That night there is wolf song from high on a ridge above us. It is a primal ululation that reverberates in my body and in my mind. I think of how often this has played out; the life in this land letting human voyagers know they are not alone. No wolf answers. She sings again and again. Finally we tip our faces and do our best to howl back, a little pack of bipedal pups in the dark wondering what we just said to something big enough to eat us. It is a drippy, misty morning, like all the others when the kayaks are secured and the four of us make our way from the water’s edge. There is a slope, gentle enough to think it slightly inviting. The ground is easier going than in most areas we have surveyed. There could be CMTs in such a place. We spread out, but travel in the same direction, our senses circular, wrapping around trees in eddies as we go. There is little need for conversation. We listen to the forest. We feel the pervasive growing greenness that will start to assimilate us if we stay still too long. I am conscious that a float plane is coming for us in another day or two so I deliberately savor the wildness, storing it up for later when I must spend time surrounded by concrete and plastic. We clear the edge of the slope to stand among ubiquitous spruce and hemlock. To the right, through the trunks, we see a steeper incline heading upward into more of the usual massive limb litter. But straight ahead the space between the trees is relatively flat, open and hummocky. A sprinkling of white catches our attention. Is it Styrofoam or aluminum foil? We move closer. Black and white bald eagle feathers of various sizes lay about the clearing. Some landed point down like little spears. Others lay flat on moss or lean against tree trunks. They pepper the ground, resembling confetti or flowers after a wedding. The pinnacles high above our heads form an arboreal promontory along the coastline making it a hangout for big birds who need space to land and take off. Briefly the clouds shift, allowing diagonal rays to pan green-gold across the cathedral-sized expanse like a breeze made of light. Each particle of misted air successively catches the sunbeams in a cascade of otherworldly illumination, simultaneously here and not here, real and beyond real, permanent and temporary. This enigmatic transcendence is what the builders of Notre Dame and Chartres were dipping into without knowing that it already existed. We step cautiously, moving around the feathers, cognizant that we have no right to touch them. Our fieldwork is the last survey before this fjord is reopened to the public on a permitted basis. Areas with sensitive cultural resources will be off-limits but there are no CMTs here. These trees have kept no memory of humans. We retreat through their dreams, back to our boats, back to the highway of the water that erases our path with each dissipating paddle stroke. Pamela Sonn holds a Masters in Cultural Resources Management from Sonoma State University. She currently teaches Hydrology, Geology, and History Through Architecture to high school students in Vermont. She uses a phenomenology-based approach to cultivate awareness and understanding because she believes that students who learn to appreciate the Earth through their senses will be less likely to make a mess of it.